IN the early days of canal and railway engineering, the only implements available were the navvy's spade and barrow, and progress was slow. Later, man was relieved of this uninspiring toil by the invention of steam-operated shovels. Nowadays it is one of the occupations of the engineer to design and manufacture excavators to handle any kind of material. The mechanical excavator digs canals and pipe trenches, tears out clay or gravel, smooths away hills and fills in valleys so as to level roads, or perhaps mines such materials as ironstone. 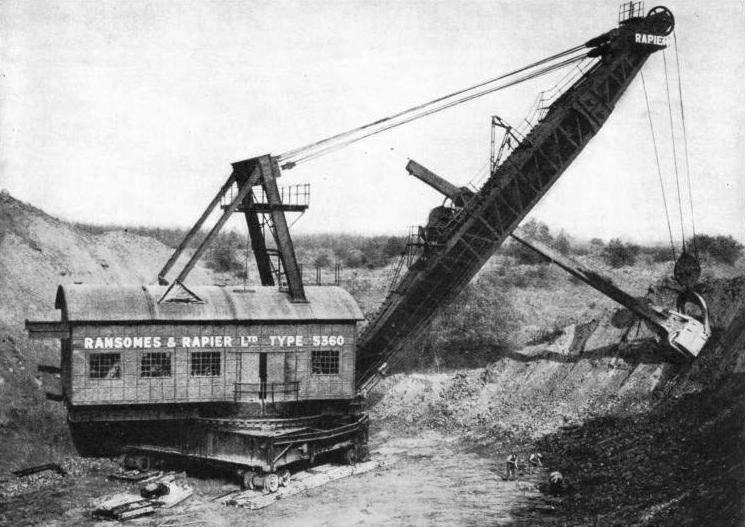 The giant modern excavator shown above is one of a number engaged in mining operations in various parts of Great Britain. A large bucket with a cutting edge is pushed into the bottom of the working face and is then swept upwards, scooping out a load of material on its way. The machine is then swung round on a circle of conical rollers until the bucket is in such a position that, when its hinged bottom is opened, the load can be dumped into wagons for removal. Excavators are made with buckets which hold only ¼ cubic yard. but this one will hold between 9 and 12 cubic yards, equivalent to loads of 12 tons and 15 tons respectively. The bucket can take a cut, be swung round nearly to the opposite point, discharge the load and be returned for the next cut once in every minute, the material being taken some 70 yards away from where it was cut. All that this requires is a man moving a few control levers in a cabin at the front of the machinery house. Electricity does the work through motors, winches, racks and pinions and wire ropes, the current supply coming through a trailing cable from an adjacent source. The machine, though it weighs 593 tons, is moved as a whole by its own power to a fresh position. The boom is 94 feet long and its angle can be varied to suit the work in hand in the same way as the jib of a crane. The dipper stick carrying the bucket is 62 ft 6 in long and is formed partly of steel and partly of a single piece of Columbian pine. It can be pushed forward or drawn back and the bucket movement is adjustable to give any depth of cut up to 55 feet, the maximum dumping height being 68 feet, and the dumping radius up to 103 feet.